Blue (left) is butterfly pea flower in water; purple (right) is flower tea dripped into white wine. Pink (center) is lemonade colored with the flower. Many flowers, fruits, vegetables, and spices are natural pH indicators. Examples include rose petals, red cabbage, beets, onions, violets, and blue morning glory flowers. These substances change color in response to acidic or alkaline ingredients. Some natural pH indicators taste terrible, while others are expensive, hard to find, or weakly colored. 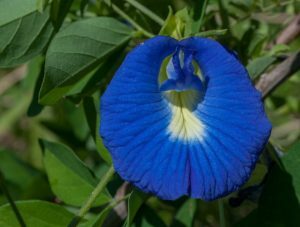 Butterfly pea (Clitoria ternatea ) flowers offer a solution to all these problems. While you might not find them in a local store, they are readily available online. The flowers are inexpensive and it only takes a few flowers in hot water to color it vivid cerulean blue. Like most other pH indicator plants, the butterfly pea gets its color from anthocyanins, specifically from a mixture of acylated delphinidin compounds. The blue color changes to purple as the pH in the presence of a little acid, becoming hot pink as the acidity increases. Aside from the gorgeous color, the best part is that the petals have practically no scent or flavor. If anything, there is a faint floral scent. The flowers or tea made from them may be added to just about any drink to color it without ruining its flavor. 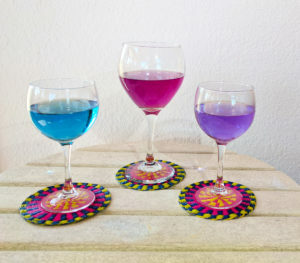 You can color just about any pale-colored soft drink or cocktail with butterfly pea flowers. One way is to brew the flowers as a tea and then use the tea instead of water in a recipe. You could even freeze the tea to make blue ice cubes. Another popular method is to prepare a simple syrup by mixing equal parts sugar and hot water and mixing in a few flowers. Unsweetened tea may be stored in the refrigerator a few days or indefinitely as ice cubes or refrigerated simple syrup. Adding a bit of the blue butterfly pea liquid to white wine will turn it purple. More acidic drinks, like lemonade or soda, will turn pink. Pour boiling water over a few butterfly pea flowers to make blue-colored water. Butterfly pea is also sold in tea bags, so you can simply brew the tea. For one glass of lemonade, squeeze the juice of one lemon into a tall glass. Add sugar or desired sweetener. It takes about 2 packets (teaspoons) of sugar for tart lemonade or 3-4 packets for sweet lemonade. Stir to dissolve some of the sugar. It probably won’t all dissolve, which is fine. Place the glass with concentrated lemonade in the freezer. Allow it to freeze hard. The purpose of freezing the lemon is to slow mixing of the acidic and neutral ingredients. If you’re making hard lemonade, pour a shot of chilled vodka onto the frozen lemon juice. Fill the glass the rest of the water with the blue floral water. The top of the glass will be blue. The middle of the glass will be purple. The bottom of the glass (highest acidity) will be pink. 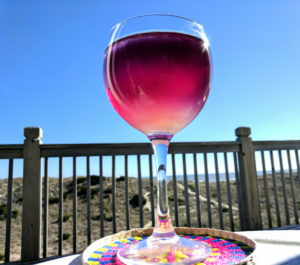 If you add ice or swirl the glass, the colors will bleed together to a final purple or pink hue. Consider using blue ice cubes to extend the color display.